Monday’s Manicure, originally uploaded by theartofaccessories. 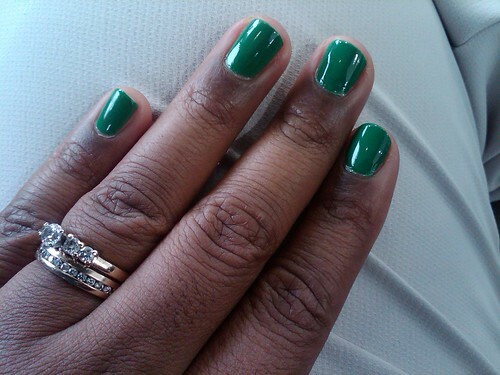 Today is the day I show you my most favorite green creme to date, Essie’s Pretty Edgy. Obviously this is my favorite because it’s the most perfect green I’ve seen in a long time. I don’t like wearing green on my toes (who wants to look like their have a fungus or mold on their toes?) but I love wearing it on my tips and this color did not disappoint me. It comes from the Essie Summer Resort collection, which I think is a bit of an odd mix. There are muted pastels and neutrals, one bold orange and this gem of a green. I didn’t pick up anything else in the collection, nothing else caught my eye or made me wish I had it as much as I knew I wanted this green. So, so pretty! LOVE! That is definitely a perfect green! I like it a lot! Now I have the urge to paint my nails! I don’t think I could pull off green, but it sure looks nice on you. I always stay in the safe zone of pinks, neutrals, or just clear polish. My toes see more colors, but you’re right about the moldy thing LOL. @Kristine I bet you could pull off green, maybe not Kelly green but I bet an olive green would be pretty with your skin tone! That green is GORGEOUS! Love it. .-= eye4style´s last blog ..OOTD: For the Love of Danny Roberts =-. Pingback: Friend Friday | Nails!